Five new presentations added from Aug. 2017 U.S. DOE Project Review Meeting, the Fall 2017 AGU meeting, and an SEG workshop from Dec. 2017. Twenty-fourth Quarterly Report for Small Scale Field Test. Twenty-third Quarterly Report for Small Scale Field Test. Six new presentations added from 2017 U.S. DOE Project Review Meeting, held Aug. 3-5 in Pittsburgh. Topics include seismic monitoring, the Small Scale Field Test project, and ICKan. New presentation added, Monitoring induced seismicity in southern Sumner County, South Central Kansas, by Zalma P. Molina, Keith A. Nolte, and Georgios P. Tsoflias, presented at Kansas Interdisciplinary Carbonates Consortium (KICC) Annual Review Meeting, March 5-7, 2017 at the University of Kansas. New presentation added, Small scale field test demonstrating CO2 sequestration in Arbuckle saline aquifer and by CO2-EOR at Wellington Field, Sumner County, Kansas, by Yevhen (Eugene) Holubnyak, W. Lynn Watney, Tiraz Birdie, Jennifer Hollenbach, George Tsoflias, and Tandis Bidgoli, presented at 12th CO2 GeoNet Open Forum, May 8-9. New photos showing work on the projects seismic stations have been added to the new Induced Seismicity section of the web site. Twenty-first Quarterly Report for Small Scale Field Test. Four new presentations added, including "Geochemical Monitoring Survey Results from CO2-EOR at Wellington Field in South Kansas" presented in April at Carbon Capture, Utilization, and Storage Conference, Chicago. Twenty-second Quarterly Report for Small Scale Field Test. Twentieth Quarterly Report for Small Scale Field Test. Nineteenth Quarterly Report for Small Scale Field Test. New presentations from Carbon Capture, Utilization & Storage Conference, June 2016. Eighteenth Quarterly Report for Small Scale Field Test. New photos from a recent tour of the CO2 injection site. New presentations from Nov. 2015 conferences. New presentation from Kansas NextStep Conference in Hays, April 2016. New photos of tanks for production associated with CO2 Injection. New CO2 Data Summary Page. Seventeenth Quarterly Report for Small Scale Field Test. CO2 injection under way at Wellington KGS Well 2-32. New presentation--An Operational Plan for Safe and Effective CO2 Injection at Wellington Field, Kansas in Perspective of Recent, Nearby Seismic Activity. New presentation--Update on Induced Seismicity Studies by the Kansas Geological Survey. First CO2 delivery has arrived at Wellington KGS Well 2-32. Sixteenth Quarterly Report for Small Scale Field Test. Fifteenth Quarterly Report for Small Scale Field Test. Fourteenth Quarterly Report for Small Scale Field Test. Wellington KGS Well 2-32 drilling underway. Presentation given at U.S. Department of Energy National Energy Technology Laboratory FY15 Carbon Storage Peer Review March 2-6, 2015. Wrap-up presentation given at DOE-NETL, Pittsburgh, PA, February 12, 2015. Thirteenth Quarterly Report for Small Scale Field Test. Two presentations from the NGWA Water Summit from earlier in 2014 have been placed online. Twelfth Quarterly Report for Small Scale Field Test. Third Quarter Report, 2014 online (20th Report). This quarterly report is the last, prior to submitting the final report. All of the tasks and subtasks are listed herein with dialog pertaining to activities conducted in this last quarter. Type logs are being checked for completeness prior to final release. Affirming possible and previously unrecognized faults has been made easier with the increase in seismic activity in south-central Kanas. The DOE-CO2 mapper has is updated to include the earthquake events since 2011 that are focused around the Mississippian Lime horizontal drilling play. Large volumes of brine are disposed in and around this play extending from north-central Oklahoma into Kansas. Increased seismicity has followed this trend. The increased in both cumulative brine disposal with some injection wells permitted at high rates (20,000 to 40,000 bbls/day) but lacking daily injection rates and pressures is problematic to understanding or modeling the role of injection and the seismicity or, important to this project, of considering the circumstances in the context of CO2 disposal that has been evaluated in this area. Accordingly, we have elevated the risk of injection of large volumes of fluids pending ongoing analysis outside of this funded program. The fact that the extensive subsurface and surface lineament database exists for the area will be critical to further assessment that will included geomodeling and simulation. Presentation given at 59th Midwest Groundwater Conference on Impacts of Carbon Dioxide Storage in the Saline Arbuckle Aquifer on Water Quality in Freshwater Aquifers. 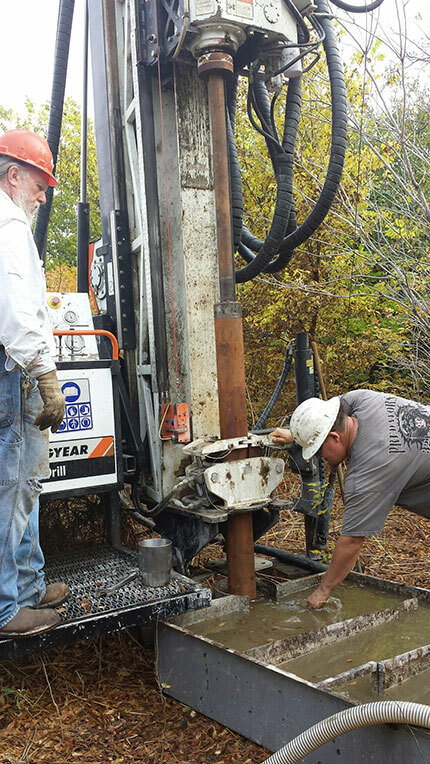 Oct. 23, 2014--Two shallow underground sources of drinking water (USDW) monitoring wells are being drilled this week to obtain a baseline water quality measurement at the Wellington CO2 injection site, as well as to determine the lowermost USDW in the area. David Garrett, a Class VI application reviewer from EPA Region 7, is present to observe the construction as Rick Miller and his team drill the wells. Lynn has been introducing David to the proposed monitoring plans and layout of the work area. Two presentations given at the NETL Carbon Storage R&D Project Review Meeting now online, one for main project and one for Small Scale Field Test. Second Quarter Report, 2014 online (19th Report). Ten regional sites were selected in southern Kansas for large scale CO2 storage in the Arbuckle saline aquifer. Estimates of the permeability, vertical and horizontal, were used to establish flow units. The test case for the modeling using the flow units was the greater Wellington Field area. The flow units in Wellington KGS #1-32 were initially defined by Mina Fazelalavi. Fifteen layers were defined. These are compared with those derived by Paul Gerlach who used vertical permeability to define flow units for the same well. Presentation at Kansas NextStep, Aug. 7, 2014. Eleventh Quarterly Report for Small Scale Field Test. Tenth Quarterly Report for Small Scale Field Test. First Quarter Report, 2014 online (18th Report). Data associated with Characterize the Ozark Plateau Aquifer System have been being compiled and are being using to establish the final regional storage assessment. Information will be uploaded to the interactive mapper and NATCARB. The latest versions of the structure, isopach, and fault maps are available, but have yet to be uploaded to the interactive mapper. The recent seismicity in southern Kansas and Oklahoma has led to a closer inspection of our assembled subsurface data, in particular, structural maps. We will confirm accuracy and consistency in mapping known and indicated faults from which will make our final interpretations. A simpler web address for our interactive mapper is now being used -- http://maps.kgs.ku.edu/co2. The digital type logs in the project will be reviewed in the next quarter before the project is completed. Similarly, stratigraphic correlations will be reviewed. Additional digital deep wells will be inventoried in the study area due the recent increase in drilling in southern Kansas and operators increasing the submission rate for digital wireline logs (LAS). Fourth Quarter Report, 2014 online (17th Report). The interactive mapper has continued to undergo changes and improvements with plans to finalize for public release in first quarter 2014. The Java-based GEMINI web application is nearing their final release in first quarter of 2014. Functionality of these applications comprising GEMINI will closely be coordinated with the interactive mapper since many applications area launched via the map. Work continues on Shuck Field southwest of Cutter to characterize and model the Chester valley fill sandstone reservoir. An example of some recent activity is recognition of karst development along the valley. Presentation AGU Fall Meeting, San Francisco, CA, Dec. 9-13. Eighth Quarterly Report for Small Scale Field Test. Third Quarter Report, 2013 online (16th Report). Weatherford Labs has completed 190 of the 307 whole core analyses and 42 of the 55 plug analyses of the 1024 ft of core acquired in the Berexco Cutter KGS #1. Whole core analysis include Kmax, K90, and Kvert, porosity, grain density, and fluorescence. Plug samples included analysis for air and klinkenberg permeability, porosity, grain density, and fluid saturations. The phi and k plotted versus depth shows preliminary, incomplete analytical results for the core interval extending from the Morrow sandstone to the lower portion of the Arbuckle Group, the Gasconade Dolomite. Two presentations for DOE Carbon Storage R&D Project Review Meeting, Pittsburgh, PA, Aug. 20 and 21. Sedimentologic and Stratigraphic Effects of Episodic Structural Activity During the Phanerozoic in the Hugoton Embayment, Kansas USA presented at the Kansas NextStep Oil and Gas Conference, Hays. Seventh Quarterly Report for Small Scale Field Test. Second Quarter Report, 2013 online (15th Report). 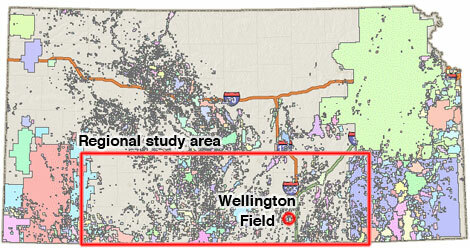 Completed Task 7.0--Evaluate CO2 Sequestration Potential in Arbuckle Group Saline Aquifer in Wellington Field. Completed Task 9.0 Characterize leakage pathways--risk assessment area. Ongoing--Results are coming available regarding the diagenetic history of the Arbuckle Group based on petrographic and fluid inclusion analysis of the Wellington KGS #1-32 and a core from the uppermost Arbuckle at the OxyChem disposal facility located approximately 20 miles north of Wellington Field. As noted in the statement of work, fractures, where present, shall be analyzed for oil staining and cementation. Isotope analyses shall be carried out on cap rocks and compared with that from Mississippian and Arbuckle Group aquifers to understand if seals had exposure to post-depositional fluids and if the cementation can prevent CO2 leakage. Petrographic and fluid-inclusion studies shall determine whether diagenetic minerals predate oil migration to evaluate seal competency. Chester Incised Valley System, Haskell and Seward Counties, Kansas, presented to the Kansas Geological Society. Sixth Quarterly Report for Small Scale Field Test. First Quarter Report, 2013 online (14th Report). Presentations from 2013 AAPG Annual Meeting in Pittsburgh, "Evaluating Carbon Storage in Morrowan and Mississippian oil fields and Underlying Lower Ordovician Arbuckle Saline Aquifer in Southern Kansas" and "Sedimentologic and Stratigraphic Effects of Episodic Structural Activity During the Phanerozoic in the Hugoton Embayment, Kansas USA". Evaluating CO2 Utilization and Storage in Kansas, presented to the Tulsa Geological Society. Fourth Quarter Report, 2012 online (13th Report). Task 7: "Static and dynamic modeling has been completed for the Arbuckle at Wellington Field for use in the Class VI injection application to establish maximum plume extent, plume stabilization time, maximum pressure response, maximum pressure boundary extent, and CO2 trapping. Additional modeling will continue, but a baseline case has been developed that is believed will provide predictable results. Updates to the modeling will be provided to stakeholders as they become available." Fifth Quarterly Report for Small Scale Field Test. Arbuckle Fluid Disposal Considerations--Regional and Local Perspectives in the Context of the Mississippian Play in Kansas, presented at TORP's Production Geology of the North Midcontinent. Integration of the recently drilled basement test at Cutter Field, Stevens County, Kansas, into the evaluation of regional CO2 storage potential, presented to the Kansas Geological Society. Third Quarter Report, 2012 online (12th Report). "Subtask 4.11. Geochemical analysis of water samples from drilling in Wellington Field and Subtask 4.12. Microbiological studies on produced water from Wellington Field. 4.13. Correlate log & core (Wellington)--extend to Ozark Plateau Aquifer System." Fourth Quarter Report for Small Scale Field Test (second revision, Nov. 12). Geological reports and LAS files on the Cutter KGS 1 well in Stevens County added as they arrive. [Oct. 5] Released rig at 12:00 am on 10/5/12. Rig down. Second Quarter Report, 2012 online (11th Report). "Subtasks completed within current quarter: Subtask 4.11. Geochemical analysis of water samples from drilling in Wellington Field (KU's Arbuckle study) and Subtask 4.12. Microbiological studies on produced water from Wellington Field. 4.13. Correlate log & core (Wellington)--extend to Ozark Plateau Aquifer System." New presentations given at Kansas Environmental Conference and Kansas NextStep Oil and Gas Conference. Progress Reports and Photos on the Cutter KGS 1 well in Stevens County. Presentations given at DOE Carbon Storage R&D Project Review Meeting, Aug. 21-23, 2012 for South-central Kansas and Small Scale Field Test projects. Third Quarterly Report for Small Scale Field Test. First Quarter Report, 2012 online (10th Report). "Subtasks completed within current quarter: Ongoing and Completed Activities--Regional Study Including Southwest Kansas--1) continue quality control, normalization, calibration of digital borehole data; 2) began construction of a 3D geocellullar model of the Arbuckle saline aquifer; 3) characterization and verification of faults using all data types including donated regional 3D seismic in order to complete structural mapping; 4) computing initial estimates of CO2 storage capacity for use in NATCARB carbon sequestration atlas; 5) reviewing new reservoir simulation of Chester sandstone in Pleasant Prairie Field; 6) interpreting and integrating 3D seismic in western Kansas to select location for new basement well. Ongoing and Completed Activities--Wellington Field--1) depth-migrated 3D seismic survey received and uploaded into geomodel and seismic inversion and shear wave interpretations forthcoming; 2) calibrating well logs for revised geomodel of the Mississippian reservoir and prepare geomodel for reservoir simulation." Second Quarterly Report for Small Scale Field Test. Anticipated Activities, April 9, 2012.
Business Implications of A Class VI Permit--The Long View? A Kansas Perspective, presentation given in support of Small Scale Field Test project. Talk given at AAPG workshop on "New Directions in Carbonates," Fort Worth, Feb. 27-29, 2012 online. A new web page has been created in support of the "Small Scale Field Test Demonstrating CO2 Sequestration" project. The first quarterly report has been placed online. All of the rest of the core photos have been placed online. Fourth Quarter Report, 2011 online (9th Report). Presentation given at AGU Fall Meeting, Dec. 2011 online. All core analyses and first core photos online. Third Quarter Report, 2011 online. Second Quarter Report, 2011 online. First Quarter Report, 2011 online. Presentation given at 2001 AAPG Annual Meeting. Berexco Wellington KGS Well 1-28 daily drilling updates. Berexco Wellington KGS Well 1-32 daily drilling updates. Wellington KGS Well 1-32 spudding in late December. Presentation given to the Survey's Advisory Council by W. Lynn Watney and Saibal Bhattacharya online. Talk on Lower-Middle Ordovician Paleokarst Architecture by Jason Rush and Tony J. Troutman online. Info on 3D seismic survey at Wellington and Anson-Bates fields by Dennis Hedke online. Fourth Quarter Report, 2010 online. Presentation added--talk given at the Annual Review Meeting, Regional Carbon Sequestration Partnerships. Continuation Application of Oct. 25 added. Presentation added--talk given at the KDHE Geology Section Fall Seminar, Wichita. Presentation added--talk given at the Kansas Next Step Conference in Hays, KS. Includes new simulation results. Gravity Data added. Included is a report on the acquisition and processing of the data, maps of the gravity stations and data, and files of the data.